England, first quarter of the 14th century. 18th-century calf gilt with silver catches (lacking clasps) in modern purple morocco box. Knowledge of the statutes of England was the basis for the administration of justice and medieval legal practice and it is probable that this manuscript was made for a lawyer; Thomas Merton: notes added to the Calendar record the births of the children of Thomas Merton, Robert on 2 May and Elizabeth on 21 October, apparently in 1491/2 ('anno vii Henrici vii'); Sir Thomas Saunder : note on endleaf ii recording his gift of the manuscript to his son Edmond 20 July 1561; Edmond Saunder: inscription on flyleaf dated 20 July 1561; Edward Ire(? ): cropped note in a 16th-century hand of the recto of endleaf ii; Ink-stamped monogram on f.16v, TSR superimposed on EL, with the date 1693; William Harcourt Hopper: his bookplate inside upper cover; sale (London, Christie's, 29 November 1999, lot 4). 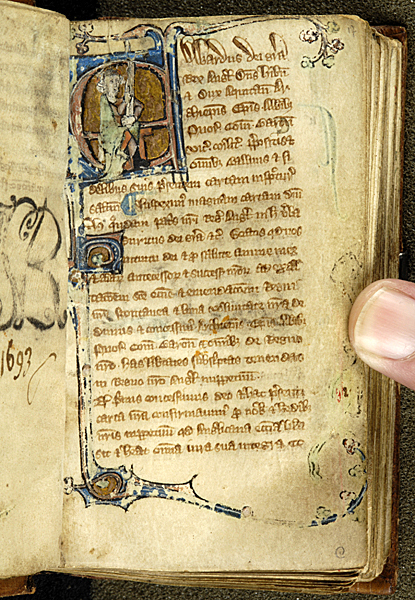 Ms. statutes written and illuminated in England in the first quarter of the 14th century. Decoration: 38 historiated initials accompanied by a cusped border with leaf terminals and marginal grotesques or drolleries; 20 large flourished divided initials of burnished gold and blue with ornate cadels and drolleries into the margin; 1 large illuminated initial with border and drollery. The subjects of the historiated initials are as follows: 1. fol. 17r: King James with Sword of Justice -- 2. fol. 25r: Huntsman and hound pursuing a stag -- 3. fol. 29r: Robert Archbishop of Canterbury addressing a man to threaten excommunication for non-compliance with the articles of the King -- 4. fol.31r: Man holding the Magna Carta complete with the King's seal -- 5. fol. 40v: King with a widow (Merton I and II concern the protection of widows' dowers) -- 6. fol. 45v: King and two officers -- 7. fol. 58r: Man entering a doorway (Westminster I protects religious houses from abuse of hospitality) -- 8. fol. 81r: King with one man by the bedside of another -- 9. fol. 88r: Seated King -- 10. fol. 91v: Head of a man -- 11. fol. 92r: Two men disputing -- 12. fol. 136v: Shopkeeper and customer -- 13. fol. 137v: King with a priest -- 14. fol. 138v: Two men disputing over documents -- 15. fol. 143v: Two men with a confiscated animal -- 16. fol. 145r: King with a merchant with a money-bag -- 17. fol. 150r: Two men, each one holding half of an indenture -- 18. fol. 153r: Hanged man regarded by two other men -- 19. fol. 158r: King questioning official -- 20. fol. 159r: One man questioning another standing beside a body (the statutes of Exeter open with the procedure for enquiring into the conduct of coroners) -- 21. fol. 166r: King ruling on the conduct of two men -- 22. fol. 167v: Three conspirators -- 23. fol. 168r: Judge and three jurors -- 24. fol. 169v: Man with a sheep (?) at the city-gate -- 25. fol. 170v: Man writing on a roll at the dictation of another -- 26. fol. 171v: Judge and petitioner examining a charter -- 27. fol. 175r: King petitioned by two men, one holding up a charter -- 28. fol. 175v: Two men arguing before the king -- 29. fol. 176v: Two men on ploughed land discussing tenancy -- 30. fol. 177v: Young man with a dying tree (introducing the statue concerning waste and destruction) -- 31. fol. 179r: Bishop adjudicating over two men -- 32. fol. 180r: King giving ruling to another man -- 33. fol. 181r: Justice on horseback entering a city -- 34. fol. 182v: King with two petitioners -- 35. fol. 183v: Armed Knight (introducing the statute governing the carrying of weapons and conduct at tournaments) -- 36. fol. 185r: Man weighing bread in scales (introducing the assize of bread) -- 37. fol. 186v: Man with a two gallon pot (?) (introducing the assize of ale) -- 38. fol. 187r: Baker who had sold short measure in a pillory, watched by two others. Collation: ii + 218 leaves: 1-38, 47 (of 8, lacking vi), 5-108, 1112, 12-168, 174, 188, 1912 (including 4 misbound folios from 17), 20-238, 247, signature marks and catchwords throughout.